A forecast released by market research firm IDC indicates that watches are going to dominate the wearable industry in 2019, with one particular model to set itself apart from the rest of the pack. 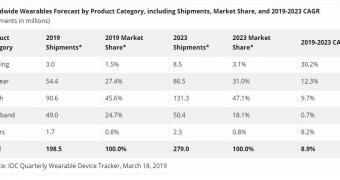 This is obviously the Apple Watch, which IDC says would help the overall watch market to reach a market share of no less than 45.6 percent in terms of wearables shipments. The wearable category defined by IDC also includes clothing, earwear, wristbands, and watches, with this last section also grouping hybrid watches and models built for children with GPS tracking.